Vitria Operational Intelligence (OI) platform blends together capabilities for continuous, real-time analysis of both Big Data in motion and Big Data at rest, giving you the ability to take timely action on the discovered insights. Data in motion includes streaming events and data from computer and sensor networks, RSS feeds, social media sites, and any other real-time data source critical to operational decision-making. Data at rest includes data in traditional databases and warehouses, enterprise applications, and unstructured data such as Hadoop. Vitria OI is designed to continuously ingest massive volumes of both streaming and stored data. The stream engine continuously queries, filters, correlates, integrates, enriches, and analyzes this data to discover exceptions, patterns and trends that are presented through live dashboards. The use of in-memory processing enables the delivery of results at ultra-low latency. In addition, the ability to easily mash up these results with external data and event sources helps deliver real-time insights in context. Low latency, continuous analysis of massive volumes of streaming and stored data – Vitria OI eliminates the latencies associated with traditional data aggregation and persistence technology. 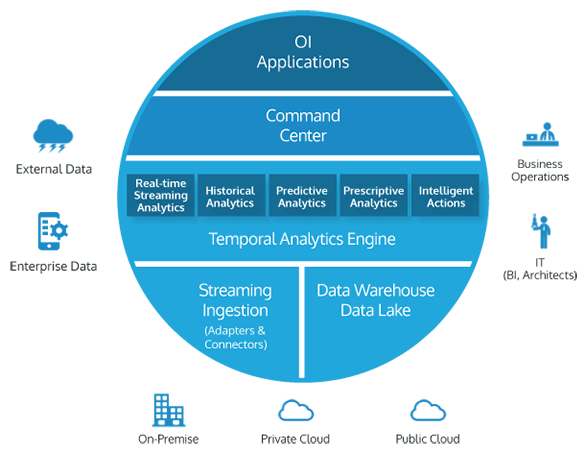 The stream processing engine enables processing of massive volumes of data to support even the most challenging Big Data in motion applications. Massively scalable and distributed parallel processing – Each component of Vitria OI can be scaled independently in a distributed architecture to meet the needs of specific applications. They can be run on commodity hardware to maximize scale at minimum cost. Hadoop-ready: Stream data in and out of Hadoop – Vitria’s Hadoop connector enables the solution to work in a complementary manner with Hadoop. It provides continuous real-time insights into streaming data together with the ability to take proactive, automated action. Data captured by Hadoop can be streamed into Vitria OI, which provides instant analysis and timely detection of opportunities and threats. Complements existing business intelligence and data warehousing infrastructure – the Vitria OI Connector framework allows for rapid integration with an organization’s existing business intelligence (BI) and data warehousing infrastructure, NoSQL databases, and other Big Data frameworks. Rapid development and deployment of Big Data applications – The Vitria Development Workbench enables developers to use a graphical, model-driven approach that facilitates rapid, collaborative development and deployment of customer operational intelligence applications. These applications provide business users with immediate access to streaming data insights without any developer support. The Vitria OI platform can deliver relevant business outcomes and use cases across industry verticals, such as manufacturing, financial services, telecommunications, retail, and more. Predictive Customer Experience – Anticipate customers’ need in real-time and enrich their experience – when, where, and how – across the customer journey to increase retention and loyalty. Fraud Detection – Identify and alert on fraud in real-time so enterprises can act proactively to prevent the fraud before it adversely impacts the bottom line. Supply Chain Optimization – Optimize your supply chain with real-time visibility – inventory management, operating costs such as transportation and distribution, and order fulfillment. Process Visibility – Gain real-time visibility of processes, transactions, and activities across an enterprise through a single pane of glass. Service Assurance – Ensure smooth business operations while delivering service – maintaining optimal quality and improving customer experience. Real-Time 1-to-1 Marketing – Drive new types of revenue and create a completely unique customer experience based on lifestyle, location, purchase history, and behavior. Want to see a demo of Vitria’s Operational Intelligence Platform?